British Memorial - THE MASSACRE AT LE PARADIS - HELL IN PARADISE - MAY, 1940. Support The Campaign for A Memorial in Norfolk to the heroes of Le Paradis. 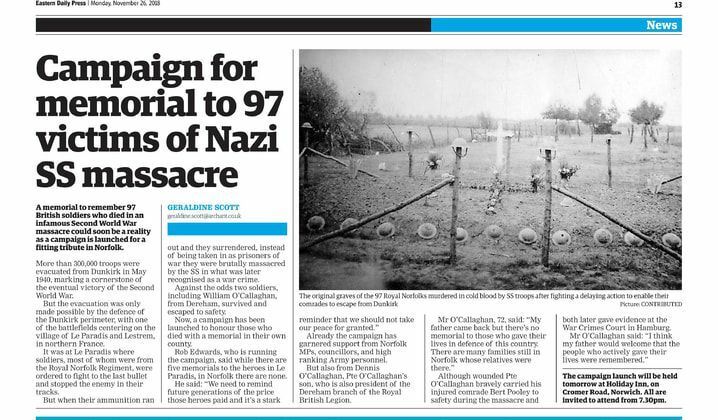 The Le Paradis Commemoration Group is supporting a campaign to have a memorial to the 97 who died in the massacre. The campaign is being led by enthusiast Rob Edwards and has the support of many high profile Norfolk people including those listed at the bottom of this page. Rob is looking for people to become founder members of the Le Paradis Memorial Support Group. If you are interested in joining our attempts to have a lasting memorial to the men who died please fill in the form which can be accessed by clicking here. The form has details of how and where to return it. In the meantime the information below from Rob Edwards may answer some of your questions. The successful evacuation of more than 300,000 troops from Dunkirk in May, 1940, was the cornerstone of our eventual victory in World War Two. It was made possible by the selfless defence of the Dunkirk perimeter by troops who knew they would not be rescued. One battlefield centred on the villages of Le Paradis and Lestrem. Here, detachments from the Royal Norfolks and the Royal Scots and other regiments fought the enemy to a standstill, inflicting heavy losses. They surrendered only when they ran out of ammunition. As Prisoner of War they were entitled to all the protection of the Geneva Convention. Instead they were massacred by their Waffen SS opponents, machine gunned to the ground and finished off with pistols and bayonets – now known as the Le Paradis Massacre. Ninety-seven died, the majority from the Royal Norfolks. However, against all odds, two survived and led the successful post-war campaign to bring to justice the officer responsible for the massacre. He was found guilty of war crimes and executed in 1949. The massacre, the courage and the sacrifice are still remembered by the French and there are several memorials in Le Paradis and Lestrem to those who died. However, there is no permanent memorial in Norfolk or anywhere else in the United Kingdom to these heroes. We need to do something about this. What can you do to help? Let us use your name. Use the form below to add your name to the roll call of Founding Supporters. This will be used in all our events to support our campaign, the first of which is our launch event on Tuesday 27th November, 2018, at Holiday Inn, Norwich Airport at 7.30 pm. You are invited to attend or to send a representative. The media will be invited so a big turnout would be beneficial. The consent form and full contact details are available by clicking here. 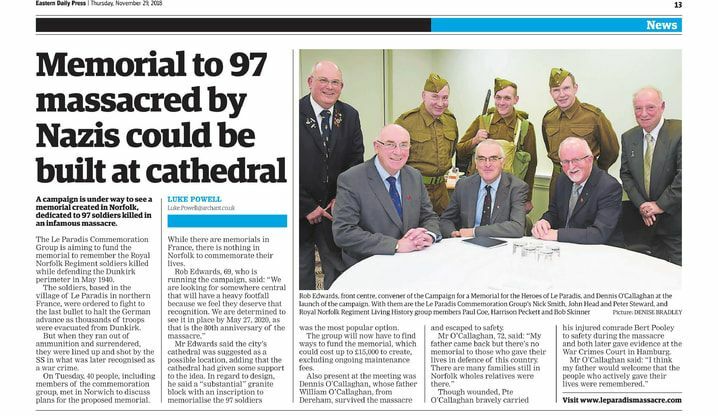 (Also on behalf of: Dennis O’Callaghan, John Head, Nick Smith and Peter Steward – the Founders of the Le Paradis Commemoration Group).